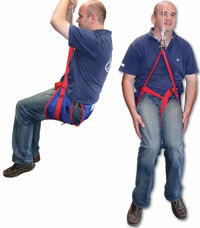 Ideal as replacements or refurbishment items in your cabin. Pelase note the latch fits all styles of knob and knobs are sold separately. Part No. 9468A Stainless Steel flush striker plate. Part No. 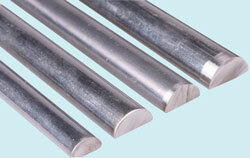 9468 Chrome Plated corner striker plate. 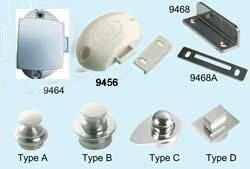 Flush fitting latch ideal for smaller lockers and cupboard doors etc. 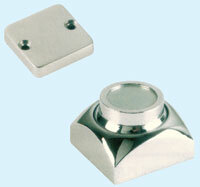 Rotating latches for doors and draws. 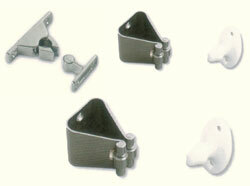 Door Latches have a rotating knob with a keeper for the door frame. Draw latches are free swiveling and hang down over the draw to prevent opening in rough sea. Both are available in either Brass or Chrome plated Brass. Round magnetic door holders, availale in Brass, chrome plated, satin chrome plated and gold plated. 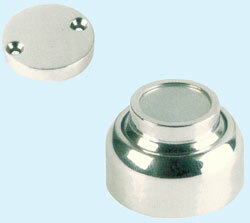 The magnet swivels to take up most angles. 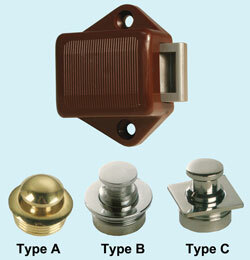 Square magnetic door holders, availale in Brass, chrome plated, satin chrome plated and gold plated. The magnet swivels to take up most angles.